A team found that male jumping spiders are using ultraviolet B (UVB) rays to communicate with females. While UVA rays are often used in animal communication, this is the first evidence that UVB light is also being used. 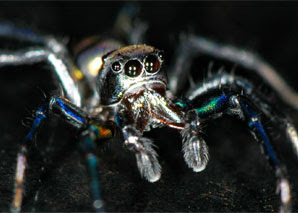 The team found that male spiders were reflecting the ultraviolet B rays from their bodies. The researchers discovered that females were more likely to mate with males that could "talk" to them with UVB compared with spiders sitting in chambers where UVB light had been blocked with filters. Professor Daiqin Li, from the National University of Singapore, said: "UVA and UVB make up a small fraction of the Sun's rays, but humans cannot see them. Most previous studies have focused on UVA in animal communication, but this is the first study of UVB on any animal. Until now, scientists have assumed that animals cannot 'see' UVB, but we have found that this is not the case." Spiders have complex eyes and although scientists know that they have UVA receptors, it remains unclear how they can detect the ultraviolet B light.